The Gary Player Bag Collection is defined by consistently high quality, stylish designs and great value sports and travel bags. 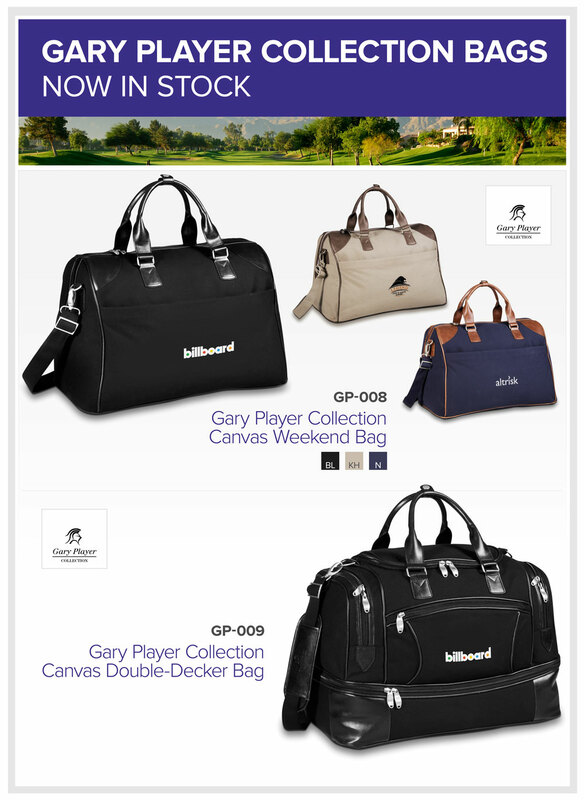 With the year-end fast approaching, consider our impressing your clients with a Gary Player Canvas Weekend or Double Decker Bag. The Bridgeport Duffel Bag is great for gym kits and club sporting events, all the while promoting your logo, brand or company name. Branded ..
Promote your gym or sports event with this printed gym bag.The Medley Gym Bag Features:- Made from 600D / 30.5 ( w ) x 15 ( dia )- Comes with adj..
Includes designated laptop-only section that unfolds to lay flat on the X-ray belt to increase your speed through security. Side-entry laptop compartm.. This lightweight laptop backpack includes a dedicated computer pocket that keeps 16" laptops safe and secure with side entry access. Open main compa.. Bringing convenience to business travellers, Elleven is the smart choice when it comes to bags for carrying laptops, mobile devices and more. T.. Perfect backpack for school promotions. Full colour Heat press is available for these bags. Ideal give away product for marketing. events. Feat..
Zippered Main Compartment With Padded Laptop Pocket, 2 Front Zippered Pockets, 2 Side Mesh Pockets, Padded Carry HandleFeatures:	Zippered Main Compart..
Stock has just arrived for these trendy new Sports Bags, available in a variety of great colours. With Health and Fitness becoming a greater focus..
Click on a logo to view the full range:	View our top corporate clothing and promotional gift brands, dominated by the popular Slazenger,..
Our stylish and sophisticated Gary Player Weekend Leather Bag is sure to be incredibly popular as corporate gifts. All of the bags featured above in.. The Gary Player Travel Bag Collection represents a executive style, and top quality design.Provide the perfect end of year gift with this selection of.. The beautifully crafted Cutter & Buck Weekend Bag is the perfect executive travel companion! Incredibly stylish and available in 3 great colours, ..